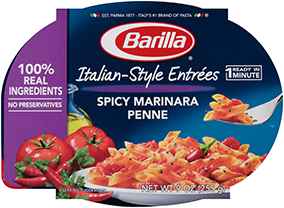 Will Barilla’s Ready Pasta product be placed on shelves adjacent to other Barilla products or will it be in a separate section of the grocery store? The location of Barilla Ready Pasta will vary from store to store. In many instances, the product will be located in the dry pasta aisle, near Barilla’s traditional pasta products or located within the convenience section of dry pasta products.